After one more holiday recipe, I promise to move on to cooking in the New Year. I’d been thinking about this cheesecake for years. I cut the pages from the December 2007 issue of Living magazine and filed them away. I remember the whole story about gingerbread from that issue. There were all sorts of pretty cookies, different ways of making gingerbread like with honey rather than molasses, and even gingerbread caramels. From that story, the White Chocolate-Gingerbread Blondies that also appear in the Martha Stewart’s Cookies book became a favorite of mine. But those little gingerbread men on top of the gingerbread-flavored cheesecake were so cute. I think of this cheesecake dessert every year for Christmas, and finally had to give it a try. You need some cookie crumbs to make the crust for the cheesecake, so making the Molasses-Gingerbread Cookie dough comes first. I made enough dough to be able to cut out some gingerbread men for decorating as well. I didn’t go so far as to make both types of gingerbread cookie dough to be able to have two colors of gingerbread men on top as shown in the photo from the magazine, but I was happy with the result with all the gingerbread men from the same dough. 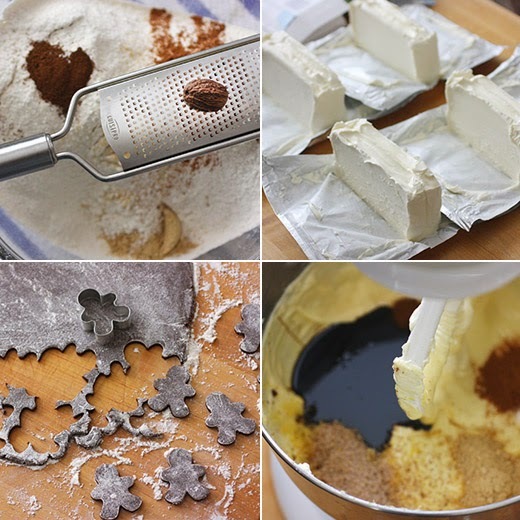 The Molasses-Gingerbread Cookies recipe is very similar to the recipe I’ve always used for gingerbread cut-out cookies. It included molasses, ground ginger, cinnamon, cloves, and nutmeg. For the cheesecake, one quarter of the dough is rolled into a big rectangle and baked until firm. When cool, it’s broken into pieces and pulsed in a food processor to make crumbs. Next, melted butter, some sugar, and two cups of those crumbs were combined and pressed into a springform pan with the bottom wrapped with foil. The crust was baked for about 15 minutes or until set. The cheesecake itself was a mix of cream cheese, sugar, vanilla, eggs, molasses, lemon zest, and more ground ginger, cinnamon, cloves, and nutmeg. I also added some finely grated, fresh ginger for an extra boost of ginger. The filling was poured into the crust, the springform pan was placed in a large roasting pan, the roasting pan was set into the oven, and hot water was added to the roasting pan before closing the oven to bake. The cheesecake needs to bake for at least an hour, but mine was still very jiggly at that point. I left it in the oven for an extra 15 or 20 minutes until the center was only slightly wobbly. When the cheesecake was completely cool, it was transferred to the refrigerator to chill for several hours. I dusted the top with confectioners' sugar before placing the cookies in a circle. It’s a shame that gingerbread only gets the spotlight during the holidays. Every time I bake with molasses, I think about how much I love the flavor and how I should use it more often. The molasses and all the gingerbread spices were delicious here from the crust to the filling to the cookies on top. Maybe I’ll finally try the gingerbread caramels the next time the holiday season arrives. Beautiful and very original! This festive cheesecake must taste heavenly. I am saving this for next year! It looks very beautiful! Very creative! Really fun -- and tasty!-- idea. Thanks. And Happy New Year! I love molasses too, Lisa. Such a nice balance between cute and refined in this cake! I am all smiles and so happy you posted the Gingerbread Cheesecake for us! A good measure of adorable with cheesecake is worthy of the first post of the New Year! Happy New Year Lisa! This cheesecake look so pretty and elegant...I like the idea of gingerbread and cheesecake in one bite. Lisa, I think this is one amazing cheesecake! Love the decoration on top, the flavors, the whole thing! We're happy to eat ginger cookies all times of the year, so I don't think I'd get any complaints if I served this winter, spring, summer or fall! It looks divine, Lisa! aww Lisa I love this gingerbread cheescake look absolutely beautiful! I love all with gingerbread!! 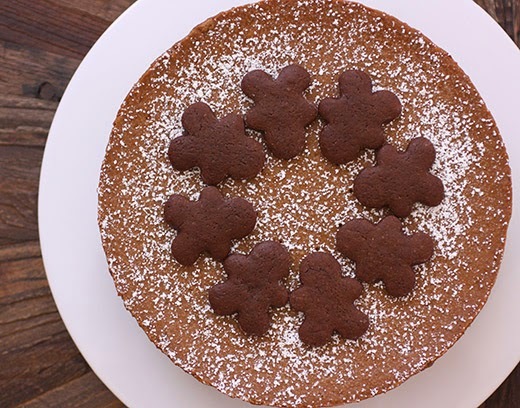 Gingerbread is one of my favorite winter flavors, love cheesecake and how you decorated it. How adorable is that?! Must have been a smash hit when you served it, Lisa. Say what you will about Martha Stewart, I tear things out of that magazine all the time. I've always been a fan. This cake looks beautiful. I have never tried gingerbread - cookies or cake and I so want to try it this year. I'm definitely bookmarking this for next year. Although, gingerbread defintiely feels like a winter flavor to me so I don't see why we can't still eat it! Oh my does that look good Lisa! You know how to do the holiday baking right! 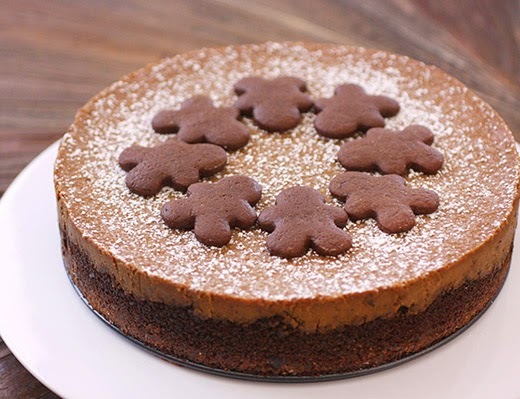 My gang would love all that gingerbread-cheesecake goodness. I hope 2015 is being good to you so far! This cheesecake looks irresistible! I have also made and love those gingerbread blondies so much.